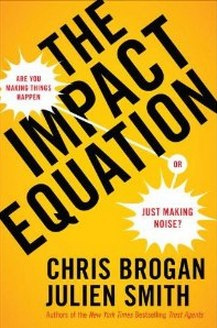 On March 28th, Marketing & Business Management, Math, and Media Communication students had the privilege to hear from the New York Times Best-Selling author of the Impact Equation, Chris Brogan. Seniors Rebecca Gray & Kayla Wood initially met Chris, who is also the President and CEO of Human Business Works, at a workshop hosted by the Boston Chapter of the American Marketing Association back in December. The girls were inspired by his talk about cutting-edge content marketing strategies used in business. When they returned from the workshop, they shared their experience with me and stayed in contact with Chris through Twitter. Over February vacation, I was thinking about another marketing expert I could bring into the classroom via Skype so that students could receive an authentic learning experience.